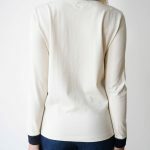 This jersey top is made of 100% organic untreated cotton, which is not pre-washed and thus will shrink about 2 cm in length and 1 cm in width. We recommend washing no higher than 40°C to avoid further shrinkage. 100% cotton jersey is slightly stretchy. Lay down a t-shirt or longsleeve on a flat surface. 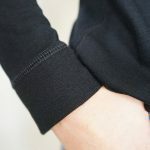 Measure the sleeve length from the tip of the shoulder to the hem of the sleeve. The length and width measurements are taken from the highest and widest points of a flat lying top Slight deviations are rare but possible due to production tolerances. 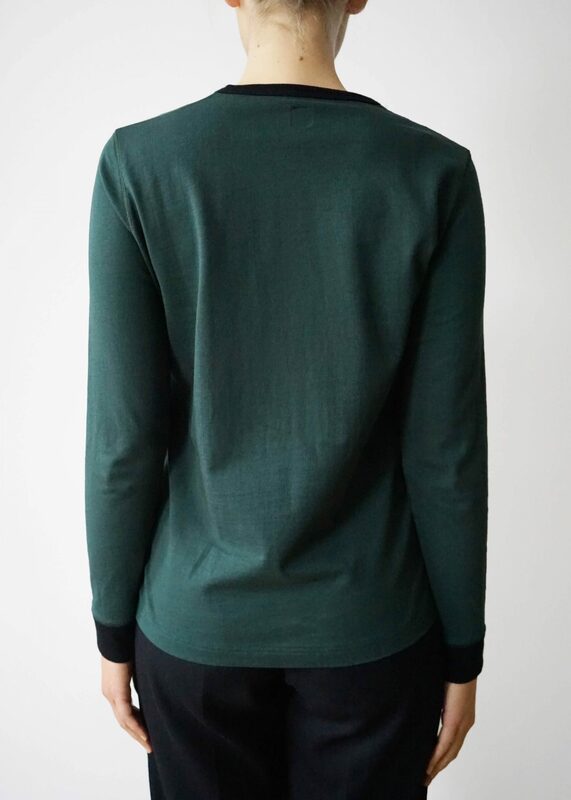 This organic cotton jersey top distinguishes itself by its highly durable jersey knit quality which was developed together with Gota – a manufacturer from South Germany – producing high quality jersey textiles on ancient knitting machines. 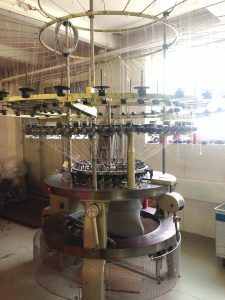 The entire dyeing and sewing processes are also done in the same town by the family-run businesses Carl Meiser and Knackfuss. The custom-made jersey textile and flatlock seaming is more robust and sustainable in comparison to conventional jersey products, as its medium thick jersey knit and high quality finishing is simply much more durable. The weight and the soft haptic of this jersey textile is simply unique in its kind and has been valued and confirmed by textile experts. Compared to conventional cotton, organic cotton farming refrains from using hazardous pesticides, herbicides, fertilisers and genetically engineered seeds by replacing it with natural alternatives that protect against pests and weeds while replenishing soil fertility. For example organic farming applies crop rotation, which is a natural and effective way to break insect pests and plant disease cycles. Cotton fibre which is not processed with chemicals is not only free of allergens but also much more durable, therefore organic cotton can be considered as much more sustainable than conventional cotton. 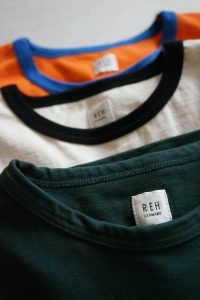 A regular cotton T-Shirt takes up to 2700 litres of water due to the need for water-scarce farming areas and the chemicals used during the growth and production stages. 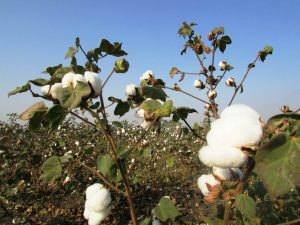 Furthermore conventional cotton farming applies monocropping or sole cropping, which is depleting the soil and making it incapable of saving water. 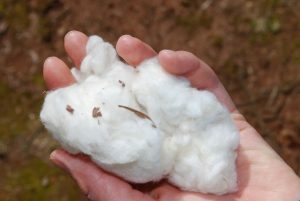 Since organic cotton is a rotation crop, the soil maintains its nutrients and much better stores water and thus requires less water than standard cotton. Moreover organic cotton is rain-fed, reducing the pressure on local water sources. The organically grown cotton from Greece combined with this rare jersey knit quality and heavy-duty finishing is making this top a coveted piece of your every day wardrobe throughout the year. As organic cotton farming requires more skill and practical labour, it is more time-consuming than conventional cotton farming. Thus the cost per kilo is higher than for regular cotton. The thicker and heavier the knitted jersey the more expensive and sustainable the jersey top. 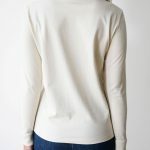 The durable quality of this heavy-duty top naturally reduces the wear and tear, thus, in the long run this top will prove to be cheaper than purchasing a regular cotton top. The refined combination of tradition, innovation and science – from farming, designing and processing naturally optimises the quality of life for all involved without compromising the environment or our health. Only after the first wash the T-shirt will shrink by roughly 5% in width and length. 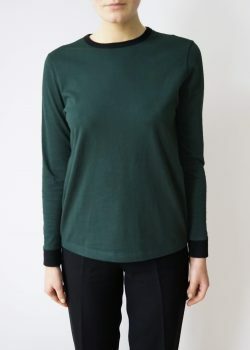 Needless to say, the size and cut of this jersey top is designed to perfectly fit your size after the first wash.
Don’t be surprised if the top fits too generously in the first place, as the length and width of the body, the sleeves and the shoulders will shrink around 2-3 cm after the first wash. So please do order your regular true size. Once washed each size from small, medium to large features a comfortable medium-loose fit. For a more relaxed baggy look order one size up. The entire jersey edition is made of 100% cotton (organic) – excluding elastane, therefore don’t expect any particularly stretchy material. High colour fastness is guaranteed after every washing cycle. Cotton is a vegan, highly absorbent and tear-resistant seed fibre, which has prevailed in the textile industry due to its skin-friendliness, durability and wearing comfort. 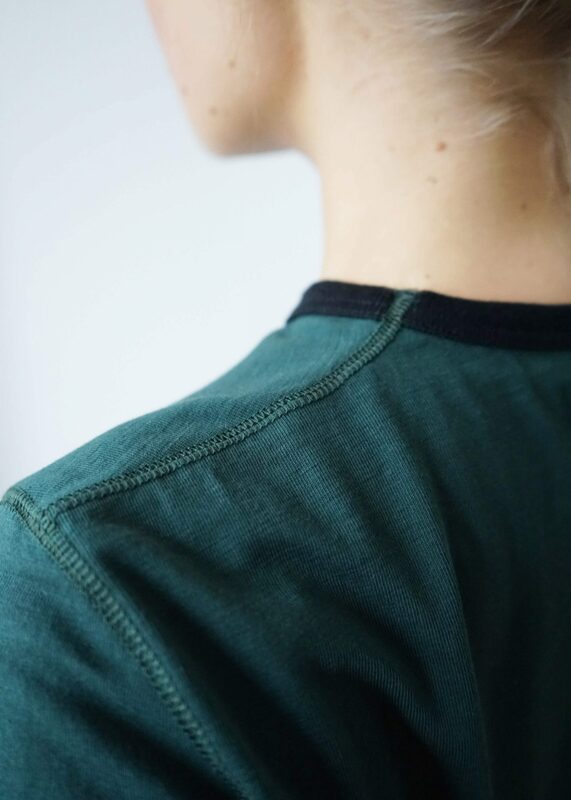 This cotton jersey features an airy feel despite its durable haptic. Cotton generally has a rather poor heat insulation, nevertheless, the weight of the cotton textile of this jersey top is designed for the usage throughout the year. The retail mark up covers a part of the R.EH research & design time, production development, studio costs, utility costs, transportation, office supplies, maintenance and costs of the online shop, insurance, legal and accounting costs and marketing. This price is applicable to non-EU customers. Import duty taxes apply. This price is applicable to EU customers only. 19% VAT is included in this price. NOTE: All prices are calculated per 1 item.